Why do shaft come in different lengths? Shafts are made of various different materials such as graphite, aluminium and polycarbonate. The weight and length of the shaft will dictate how the dart performs in flight. If you are new to the game a good idea is to try different lengths of shafts and find one standard that fits your style. Shafts come in many different shapes and material. Here you will find a wide selection of different styles of shafts. Shafts are also called stems. The cheapest shafts on the market today. These flights are in small, medium, large and Extra Large size. Nylon shaft can easily brake, and when these shafts break it can be a little bit tricky to get the last peace out of the barrel, but there is a tool for that so you can easily screw out the reaming part. The nylon shaft is often sold in big packs with 15 or more sets. The price will very from vendor to vendor. But if you use this kind of shaft make sure you have some with you at all time and it’s not so expensive. These shafts are a little bit more expensive then the nylon shaft. However this type of shafts doesn’t break, but they can easily get bended, a drop from the dartboard to the floor can be enough. It’s very difficult to bend them back to it’s original state when they first get bend, witch can again lead to problems later when you throwing the darts. This is type of shaft is new in darts technology. Magnesium shafts are ultra light shafts. They are a little bit more expensive than aluminium shafts. This is the strongest shafts on the market today, and also the most expensive ones. They have all the advantage like the aluminium shafts, but they cost a bit more. The advantage with the Titanium shaft is that they not bend that easily and are almost indestructible. Sigma pro shafts come in many different designs. They have a unique technology and it's also built in flights protectors. These types of shafts don’t break that easily and come with replaceable flights holders in nylon. Sigma Pro Shafts are made in titanium based material, nylon, magnesium and aluminum so you have a wide range to choose from. 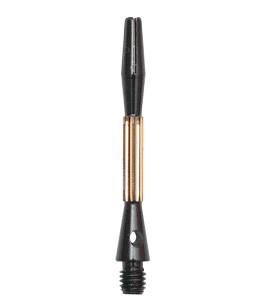 The main advantage with this type of shafts is that it extends the grip to base of your darts. Or you can say that it extending your darts. Steel shafts have a slim design, and most of them with opportunity to replace the top of the shaft holding the flights. Steel shafts are not that expensive, the prise range is more or less the same as aluminium shafts. Graphite has a higher strength than steel. When combined with a low weight to volume ratio, this makes an ideal combination of lightness and strength. As a result of this graphite has been used in many sporting applications including: golf clubs, fishing rods, tennis rackets and snooker cues. The carbon Plus shaft, which features a super light graphite rod, weights in at a mere 1.0 grams. This type of shafts have some higher price range. This shaft has a weight of total 4 grams, much more than normal shafts have. If you like to experience with different shafts try this model. After several laboratory test on Heavy Metal Shafts, Harrows Technology have established that the midi length (41,5 mm) works best for the majority of darts players. This shaft is perfect for players that want the dart to enter the board with tail down, this again for top stacking or grouping. There is a lot of accessories for shafts. O-rings, Shaft Crowns, Shaft Snap Rings, aluminium rings and much more. O-rings are great for attaching aluminum, titanium, magnesium and steel shafts to the darts. Without O-rings you need to tight the shafts to the darts all the time. It's also easy to mount with help of a Tool called Shaft Lock System. When you use nylon shafts o-rings are not necessary. Shaft-Snap Rings and shaft Crowns. This type of accessories is used with nylon shafts, and it keeps the flights tightened to the shaft. Often when you started to get the grouping right and the 180's is all up in there, the flights bounces of the shaft. With Snap Rings /Crowns the flight will stay mounted on the shaft. Some players use glue on the flights when they mount it to the nylon shafts, this is a good solution to keep the flights on the shafts, but it can be a bit expensive because you have to replace the shaft and the flights if any part gets broken.